This biography, originally published in 1907, offers a rare look at a fascinating man! 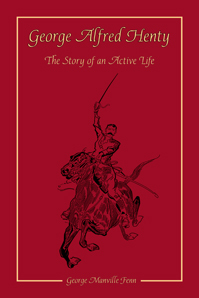 Written by a friend and colleague shortly after Henty’s death, it chronicles Henty’s life from his sickly childhood to his adventurous life as a war correspondent and later as a prolific author. This book will be a beautiful addition to your family's library! Historical Notes - As a foreign correspondent for The Standard, Henty wrote about wars and events that may not be familiar to the modern reader and so we have added brief descriptions of the major events mentioned in this book. 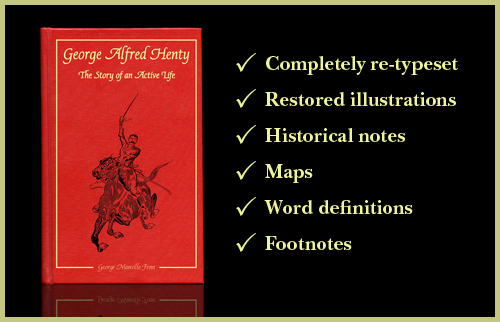 Maps - We have created nine maps so that the reader can easily see the locations where many of the events in Henty's life took place, including his travels to such places as the Crimea, Italy, India and Abyssinia (present-day Ethiopia). Word Definitions and Footnotes - We have added over 1,000 definitions and footnotes for words, foreign phrases, people, places, events, literary references and more, to better aid the reader's understanding. George Manville Fenn (1831-1909), was a popular English boys’ author in the late 1800’s. In addition to writing over 100 fictional stories, including some historical fiction, George Manville Fenn worked as an editor, a publisher and a journalist.